What are the minimum admission requirements? The minimum requirements include one letter of reference, a personal statement and a transcript of your academic records. For more details please read the instructions available on the main SURP webpage. Meeting the formal requirements does not warrant admission. Can I submit my application via e-mail? I don’t live in Canada. Am I still eligible to apply? While we would love to host you, we are currently unable to offer fellowships to international students. I would like to work with a specific professor, but their name is not listed on the SURP website. Can I still apply? Yes, you should. However, we strongly encourage you to first contact the faculty member you are interested in working with directly. Do I have to provide an official transcript of my academic records? While we encourage you to provide an official transcript, this is not a strict requirement. However, if your application is successful, you will be asked to submit your official record. When will I hear back from you? We do our best to evaluate the applications as soon as possible. The processing time can vary depending on the number of applicants. You should expect to hear back within one to two months following the application deadline. Will I get feedback if my application is unsuccessful? We will inform you of the outcome whether your application is successful or not. However, due to the high volume of applications, we will not be able to provide detailed feedback. Is the start or end date of the program flexible? 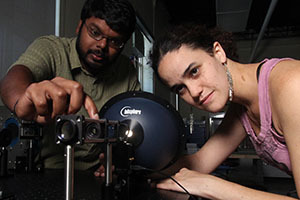 Former SURP student Miranda Jarvis and the Dunlap’s Prof. Suresh Sivanandam test components of a calibration unit for the Wide Integral Field Infrared Spectrograph (WIFIS) during the 2015 SURP.